Cleopatra, who ruled ancient Egypt almost three decades, was known for her love of figs. Her death is even speculated to include the enticing fruit. It is believed that the beloved Queen either used a basket of flowers or figs to hide a poisonous snake for her suicide in 30 BC. Figs were also influential in Ancient Greece. Greek athletes ate them during training for Olympic Games. They were also an everyday food for the poor and the wealthy. In fact, the fruit was so heavily used that the Greek government banned any export of it. It is told that Demeter, the Greek goddess of agriculture, grain and bread, presented the fig to mortals as the first fruit of autumn. It signified a fertile offering for the changing of seasons. Demeter gifted the first fig tree to Phytalos after he welcomed her into his home. In the Old Testament of the Bible, Eve is mentioned using fig leaves to cover her and Adam’s bodies. There are even references of the fruit in the New Testament. Talk about being popular, this luscious fruit is found throughout religious writing and art! Many religions such as Hinduism, Buddhism, and Judaism still use figs in sacred practices. It looks like some fruits just never go out of style. Figs are not only juicy with historical stories, they’re also packed with health benefits. So, live it up like Cleopatra or the Greeks and enjoy these delectable beauties. Eating them daily can increase your intake of minerals, calcium, and potassium. 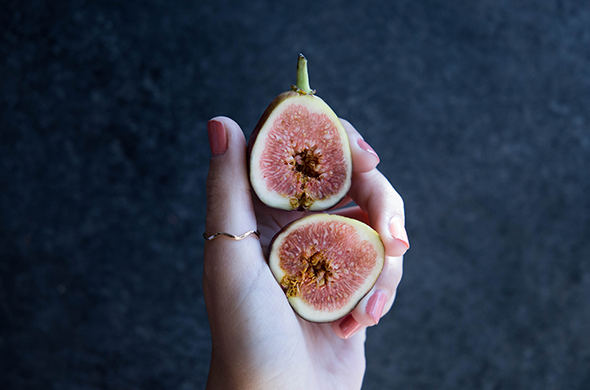 Figs continue to get a standing ovation for their source of fiber (insoluble & soluble), potassium, manganese, and vitamin B6. Even more, they have soluble fiber such as pectin, which is a prebiotic! Prebiotics help promote the growth of probiotics such as those found in our kefir. Figs may be ancient, but their flavor remains timeless. They come fresh, dried, frozen, and in jams. You can use this versatile fruit to craft a fig face mask or just simply add some to your meals each day! Get creative and add figs and fresh to your kefir cup or morning toast. Here are some of our fig recipes: Farmer Cheese Stuffed Figs, Almond Honey Fig Smoothie, Honey Fig Toast on Sourdough.